There are many garden wedding flowers that can be a great addition to your wedding. 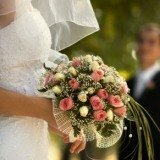 A few factors should be considered when deciding on the flowers that are right for your big day. First, start with the season you are getting married and work from there. Whether it is spring, summer or fall, there are many beautiful varieties of flowers to choose from. Then, consider where you are getting married. Garden weddings work really well in parks, bed and breakfasts and historic locations, and each offers a unique style and different opportunities for flowers. For your ceremony, you may want to exchange your vows under an arbor, arch or gazebo, and each can be decorated with beautiful garden flowers. Vine flowers, like clematis, wisteria and trumpet vine come in stunning, vibrant colors. If your ceremony is going to be outside, place flowers on the first chairs next to the aisle. You can also cover the aisle or reception area with a flower carpet for a fun, colorful effect. Visit our garden wedding ideas page for more details on how to do this (under reception details). 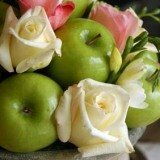 To help sort out all of your flower options, work with a florist that is experienced with a garden wedding. Also, you may want to consider working with a wedding planner to help with decorating your ceremony and reception spaces as well as helping with you sort out your ideas. Perfect for decorating an arbor, gazebo or arch, clematis can be found in several beautiful colors including pink and purple. A climbing vine, wisteria is found in a beautiful purple color that is perfect for weddings. Look for locations where wisteria grows naturally, or work with a florist on options for adding it to existing arbors or arches. Appearing in orange and red hues, trumpet vines can add some color to your wedding day. They work very well by themselves or in combination with other similar vine flowers. Imagine getting married surrounded by sunflowers. Sunflowers make a great wedding theme, and you can learn more by visiting sunflower wedding theme. Mums are perfect for late summer and fall weddings. Place potted mums around your reception space, or have them hanging from the edges of your wedding tent. Another flower that is perfect for summer and fall weddings, hydrangea comes in several stunning shades of pink, blue and purple. For even more ideas visit our spring and summer wedding flower guides.